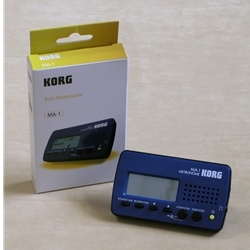 Korg's compact digital metronome with LCD pendulum, tap tempo auto-set function, and 13 pre-set rhythms which includes downbeats for measures of 2-7 beats, and subdivisions of eighth notes, triplets, triplets skipping the middle one, sixteenth notes, and sixteenth notes skipping the middle two. It also sounds one chromatic octave, c'-b' (calibrates to several hz on either side of both A=440 and A=415). Uses 2 AAA batteries (included). All you need in a metronome, for a low price!